The European Parliamentary Elections will take place on Thursday 23rd May 2019. The announcement of the election follows the agreement of an extension to the UK’s exit from the European Union. While the UK remains a member state of the European Union, it is required to elect members of European parliament. Cherwell District is part of the South East Region, consisting of 67 local authorities which currently elects 10 members under a proportional representation system. If you would like to vote but perhaps haven’t registered, or have moved/due to move house, you have until midnight on Tuesday 7th May 2019 to register to be eligible to vote in this election. If you are registered but will be away on polling day, you can apply for a postal vote. Completed applications for postal votes must be received no later than 5:00pm on Wednesday 8th May 2019. If you are going to be away on polling day, but do not want a postal vote, you can appoint a proxy (someone who votes on your behalf) to vote in your usual polling station. 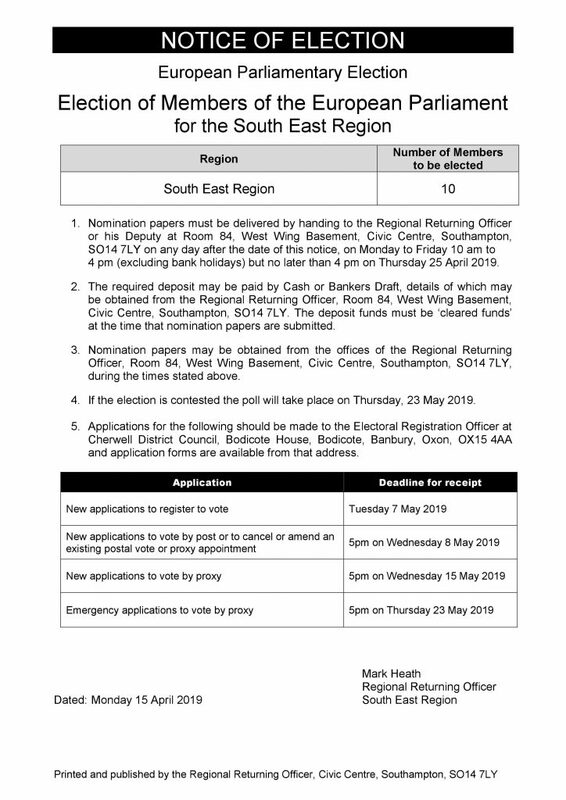 Completed applications for proxy votes must be received no later than 5:00pm on Wednesday 15th May 2019. Citizens of European Union countries (other than the UK, Republic of Ireland, Malta and Cyprus) will be sent a form they need to complete and return by Tuesday 7th May 2019 to opt in to vote in the UK rather than their home country at these elections.